InfoComm 2018: Torus Power Isolation Transformers Provide Significant Performance Benefits for Commercial AV Systems | KMB Communications, Inc.
Toronto, ON, Canada (May 2018) Torus Power will showcase the performance benefits toroidal isolation brings to commercial applications during InfoComm 2018, taking place June 6–8 at the Las Vegas Convention Center in booth #N2834. By exhibiting at InfoComm, Torus confirms its commitment to the commercial market with proven toroidal technology for commercial applications of any size. There, Torus will showcase its full line of toroidal isolation transformers, from the powerful and robust Wall Mount (WM) line to the versatile, lightweight, and compact POWERBLOCK (PB) units. In commercial applications, an effective power foundation is key to leveling the playing field and making sure that any equipment in your system is performing at its optimal level. Built in a variety of configurations to accommodate the needs of commercial AV applications of virtually any size, Torus Power delivers clean, uninterrupted power for today’s most demanding projects.Time-tested technology such as Series Mode Surge Suppression and noise filtering through proprietary Narrow Bandwidth Technology (NBT) allow sophisticated audio-visual components to deliver superior performance. Audio comes alive with a lower noise floor, better dynamics, imaging and bass, and video is notably crisper with brighter colors, deeper blacks, and a more compelling overall image. Additionally, when installing expansive and expensive systems as typically found in commercial spaces, integrators can’t afford to leave equipment unprotected and vulnerable to harmful power conditions. 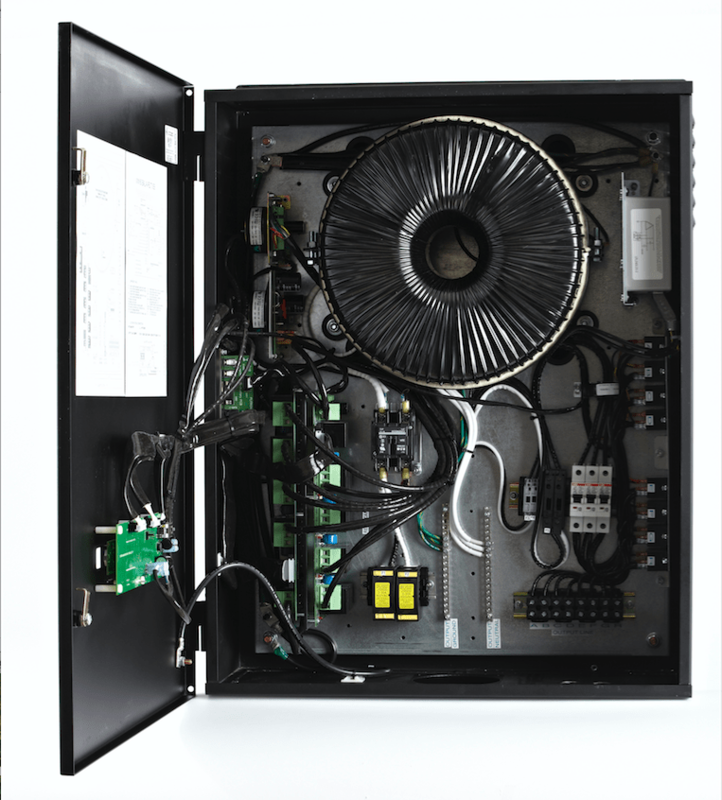 That’s why Torus Power uses a toroidal isolation transformer to physically decouple the equipment from the power supply, delivering safer, cleaner power for sophisticated AV systems with a substantially low noise floor. Resulting performance benefits are noticeable, compelling, and appealing. For instance, John Mayfield, owner of renowned Nashville studio Mayfield Mastering, recently installed a Torus Power unit and noticed significant improvements in the audio quality of his $80,000 powered speaker system. “I built the room in 2003, and it has never sounded better. I don’t know of any system that’s better at this point,” says Mayfield. POWERBLOCK (PB) Series – The new Torus POWERBLOCK (PB) Series of isolation transformers brings enhanced performance and protection to even the smallest AV systems. The PB series takes all of the best Torus tech and ports it into compact and lightweight units. The new PB 4 isolates outlet pairs to separate source components from power components for a cleaner signal and exceptional audio-visual experience. The smaller PB 2 is perfect for applications where only a few critical components need superior protection and power isolation. Wall Mount (WM) Series – Designed for larger projects with 240V input, the Wall-Mount series packs all the features of Torus Power’s rack mount units into a system that provides a source of clean, uninterrupted power for large installations or applications with no rack space to spare. At InfoComm, Torus Power will display its WM 60 BAL AVR2 TVSS, a toroidal isolation transformer that feeds up to eight racks with 60V output and features cloud-based monitoring, automatic voltage regulation, and transient voltage surge suppression. The TVSS device responds in under five nanoseconds to manage surges up to 80,000 amps, while offering additional noise filtration of EMI and RFI. Automatic Voltage Regulation (AVR) Series – Fluctuating voltage conditions can adversely affect sound and image quality and shorten the life of AV equipment. Torus Power AVR units, including the AVR, AVR 2, and TOT AVR, employ automatic voltage regulation to provide superior protection from voltage sags, surges, and brownouts. Stacked with features including Ethernet control and IP addressability for remote monitoring and management, the AVR2 20 RK isolation transformers enhance the performance of any commercial AV system, while protecting equipment from surges, spikes, and brownouts that can be caused by a variable grid. TOT Series – The award-winning little brother to the AVR series, the TOT AVR delivers the same robust feature-set at a more affordable price. Housed in a compact, 2U chassis, the TOT AVR is rated at 4 amps and is designed for smaller AV systems requiring optimal performance and consistency. AVR units keep connected equipment within the optimal operating range of 115 to 125 volts, with an input voltage of 90V to 130V +/-10V, regardless of line voltage fluctuations. To learn more and to see the many options available for both small- and large-scale commercial AV applications, visit the Torus Power team in booth #N2834 at the Las Vegas Convention Center during InfoComm 2018, June 6 – 8, 2018. For more information about Torus Power, visit www.toruspower.com and follow Torus Power on Twitter @TorusPower and Facebook. Toroidal isolation power transformers by Torus Power are the world’s finest clean power source for audio, video, and control systems. Dramatically increasing performance levels of connected AV components from video displays to amplifiers and powered speakers, Torus Power products utilize Plitron Manufacturing’s patented NBT technologies and medical-grade toroidal isolation transformers to eliminate virtually all power-line noise artifacts and protect equipment from potentially damaging AC power line events, while increasing system reliability and extending product life. Torus Power products deliver higher levels of instantaneous current which ensures that dynamic components and high-performance systems are never compromised, nor starved for power.